CSU has welcomed the announcement today by NSW Deputy Premier and Minister for Regional NSW Mr John Barilaro and Member for Dubbo Mr Troy Grant of $9.3 million funding for the Regional Sports Hub to be located at CSU in Dubbo. Charles Sturt University (CSU) has welcomed the announcement today by NSW Deputy Premier and Minister for Regional NSW Mr John Barilaro and Member for Dubbo Mr Troy Grant of $9.3 million funding for the Regional Sports Hub to be located at Charles Sturt University (CSU) in Dubbo. This funding secured under the NSW Government’s Regional Sports Infrastructure Fund marks ‘Stage One’ and a significant first step towards the planned $44.5 million Western Region Institute of Sport. CSU Vice-Chancellor Professor Andrew Vann welcomed today’s announcement, saying CSU will have capability in the new facility to offer expanded academic offerings in the area of Human Movement as well as roll-out an expanded clinic model for other health services beyond the existing Dental Clinic. “This is a very exciting major development for the University and the whole Dubbo community,” Professor Vann said. Professor Vann said the Hub is part of a bigger vision for a health, education and well-being precinct that will ideally see more development around the already committed infrastructure. “With this announcement, the Berejiklian government has demonstrated an investment in Dubbo’s health and economic development,” he said. 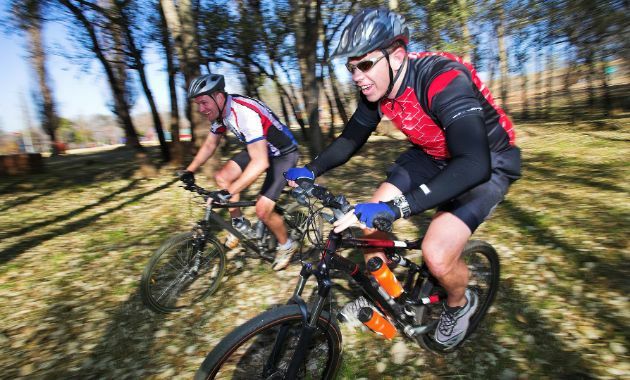 The project proposes the construction of an indoor multi-sports facility, conjoined with outdoor sporting facilities including the adjoining new cycling precinct, and a sport and health administrative hub on the one site. PCYC NSW and western region Office of Sport will create a regional hub that services the wider region as well as the social needs of the Dubbo local government area. Once completed the centre will feature up to eight indoor courts, a show court, a 3,000 square metres national competition standard gymnastics floo, sporting fields, and break-out areas for young people and university students. The flexible multi-purpose space will be able to be configured to meet multiple user needs including sport, fitness, active recreation, education, youth services, and the ability to host local, regional, state, national, and international events. The development at CSU will be in partnership with the Dubbo PCYC, NSW Sport and Recreation, and Dubbo Regional Council. The new facility would host local and state level competitions and training sessions for a range of codes and clubs associated with Cricket NSW, NSW AFL, Penrith Panthers and Country Rugby League (Western), and the Liverpool Football Academy. It is anticipated that clubs affiliated with Basketball NSW, NSW Karate Federation, Wheelchair Sports NSW, Netball NSW, and NSW Rugby Union are among other sports that will also use the new facility. The Regional Sports Infrastructure Fund is part of the NSW Government’s $1.6 billion Regional Growth Fund, designed to improve economic growth and productivity with investment in regional communities. The announcement by the NSW Deputy Premier and the Member for Dubbo was at 11am Tuesday 11 September on the proposed site at CSU in Dubbo. Contact CSU Media to arrange interviews with CSU Vice-Chancellor Professor Andrew Vann. 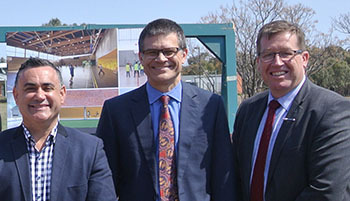 Photo (left to right): NSW Deputy Premier Mr John Barilaro, CSU Vice-Chancellor Professor Andrew Vann, and Member for Dubbo Mr Troy Grant.